Here’s My Five Minute Tutorial on Getting Ranked On YouTube! Let me start by saying, this is an alternative lazy method. The real sure-fire way would be to conduct your keyword research, analyze the competition, and make sure all your SEO is done, however what I am about to tell you is based on others success, and it works, so the choice is yours! Let me do you a favor. I’m going to save you a ton of money. All these courses out there tell you how you can get ranked on YouTube, SAVE YOUR MONEY! I’m going to tell you exactly what you need to do. The best part….It’s not going to cost you a dime. You ready? Cause it’s real simple! We First Need to Look At Other Members On YouTube, with Similar Content! - Let’s first take a look at the number of views these videos have received. 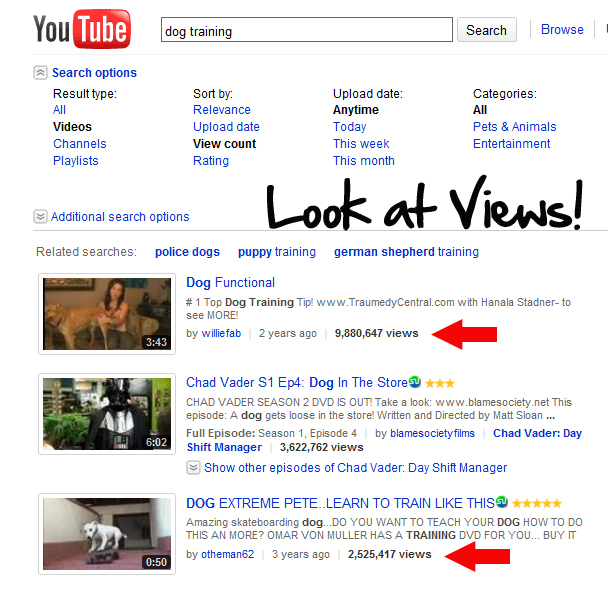 - Depending on how you are viewing this, the default is set to show you “anytime” views. This means they will show you views since the video was first loaded into YouTube. Make a note of the videos with the most views. Make sure the videos are similar in nature to your video. You need to also do a search for the same terms with the upload date changed to “this month.” Once again seek out the videos with the highest views. This tells us that your niche or trend is still receiving searches, or is considered a “Hot” topic. You can also check Google, Adwords, Clickbank, or any other means of evaluating a current trend. Ok, so we have identified successful videos in our category, were not wasting out time because we know it is a current trend that is getting current views this month….time to submit our video and hope for the same results.! There is 4 things that we are going to “Borrow” from our videos that we made note of in step #1. First take a look at this screen shot of a YouTube video below. Here’s what you need to do….you see those 3 areas i have pointed out? Submit your video using the same tags. Try not to deviate, You can change the description up a little bit, but remember….whatever this person is doing is working! 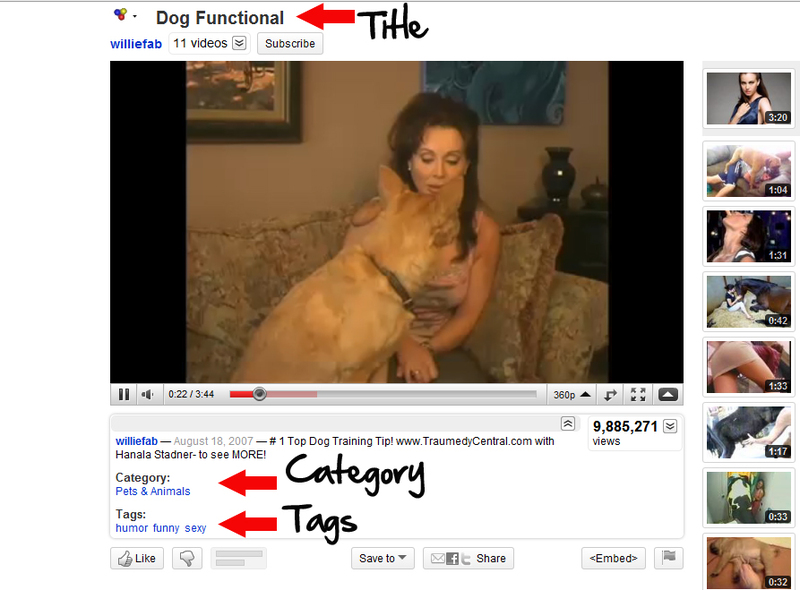 The keyword is anything that a viewer might search for to discover your site. Follow these simple steps and your video should be getting some descent reviews. Be sure to include the two bonus sections I have included below. Want to help you the best way I can. - TIP #2 This wont last, so do it while you can! While your submitting your comments off to the right hand side, YouTube allows you to respond to the users video with another video. The idea is that you would take the time to record yourself giving a response to that video on your own video. So for the time being, you can simply submit one of your own videos, doesn’t have to be a response, but I’m sure they’ll change that soon! -Tip #3 Once you have your video submitted, here is a sure fire way to get traffic to it, and FAST! Do a search on Google for “Social Bookmarking” sites. This consists of De.licious, Digg, Reddit, etc… There is probably 1000′s of bookmarking sites out there. Sign up for your FREE account and bookmark your video. Be sure to use your keywords when it asks for title and description. This method has had me at the top of Google within hours. Well there you go, and I didn’t charge you $197 either for that info. Let me know what you think, and good luck with those YouTube Rankings!